By Keith Cowing on January 4, 2018 1:19 PM. "Latest Action 01/03/2018 - Returned to the President under the provisions of Senate Rule XXXI, paragraph 6 of the Standing Rules of the Senate." Keith's note: Rep. Bridenstine's nomination has now been returned to thee White House by the Senate. The White House will have to be resubmitted for the second session of this Congress. All sources report that the Administration is still quite firmly behind Bridenstine and that this "re-nomination" is simply a matter of routine paperwork that will happen after the holidays. Whether there will need to be another confirmation hearing is unclear at this point. Bridenstine's nomination to be NASA Administrator did not come up for a vote in 2017. Right now the expected support for Rep. Bridenstine remains exactly where it has been for him (and many other Trump nominees) for many months: split along party lines. With Sen. Rubio still in the "no" column. If the vote were taken in December (and Sen. McCain and Sen. Cochran were well enough to be in town to vote) it is expected that Bridenstine would have been confirmed 51 to 49. Senator-Elect Jones (D-AL) has now been seated so the expected vote would now be 50/50 with Vice President Pence casting a tie-breaking vote - if nothing else change interms of the party line split with everyone voting and Rubio's stance. In the Senate 30 hours is formally set aside for confirmation of nominees. But usually the 30 hours is waived by unanimous consent or significantly shortened by agreement between Democrats and Republicans to a much more manageable period. Alas, Sen. Nelson has refused to accept any deals. As such there was simply no way to really schedule this confirmation in the remaining time that the Senate was going to be in session in 2017. This issue will reassert itself when the White House takes a second run at nominating Bridenstine in 2018. More details on this issue can be found here. This page contains a single entry by Keith Cowing published on January 4, 2018 1:19 PM. Big Gaps In Exploration Are Normal was the previous entry in this blog. 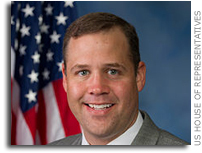 Bridenstine On Earth Science: "We Need To Follow The Decadals" is the next entry in this blog.